Allerton (population 293) is located in east-central Illlinois in the far southwestern corner of Vermilion County. A portion of the town is also located in southeastern Champaign County placing Allerton about 20 miles southeast of Champaign/Urbana. Illinois Route 49 is the main roadway leading you to and from town and intersects with County E 300 North at Allerton. The Goodall Branch flows to the east of town and the Missourri Pacific Railroad (formerly the C & E I(Central and Eastern Illinois) layed tracks through Allerton. This railroad however no longer exists as the tracks have been removed. Allerton was platted in 1887 by Samuel Allerton and was named after him. The photo to the right was located on the website www.infinityfarms.com. A story of one person's life growing up in Allerton in the 50s and 60s can be found on the webpage of http://staff.ed.uiuc.edu/cgodwin/Home/allerton.html. "The growth of a high school or any school may be licensed to the growth of a home. As the family increases in numbers, as the horizon broadens, new rooms may be added to accommodate that growth." "We would like to trace briefly the growth of our house, and, much more important, the growth of the group within. But to understand fully the history of this school we must understand something of the careers of the schools which served this community." 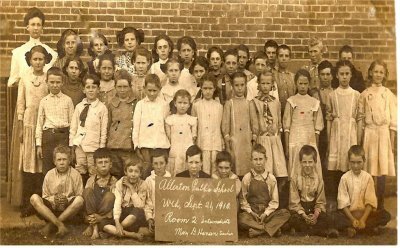 "The first school was opened in Allerton September 2d, 1892, in a small frame school house that had been moved from one mile north of town, with Chas. Smeeton, Sr. as teacher. Meanwhile movement was started by which we were granted a new district, by two of the Trustees, viz, Taylor Gerlaugh and J.J. Southworth." "This district was formed out of territory from four districts, and comprised eight sections of land. The Board of Directors for the new district was J.H. Herron, Geo. Allen, Sr., and Joseph Warters." "S.W. Allerton, of Chicago, donated twenty-five hundred dollars toward the erection of a five-thousand dollar building. 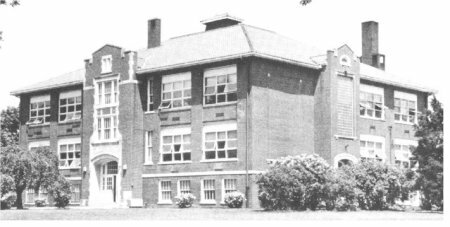 A meeting was held, and bonds to the amount of three thousand dollars were issued and sold to Dr. E.L. Hardman for the building and furnishing of said school building." "The new district had much opposition, and after the decision of the County Superintendents of both Champaign and Vermilion Counties had been sanctioned by the Circuit Court of Champaign County, the parties in opposition carried the suit to the Supreme Court, where the decision was rendered in favor of the new district. Meanwhile Architect Ennis of Danville, had drawn plans for a four-roomed building, with all the necessary halls and cloak rooms. A substantial brick building took the place of the old frame one." "The year of 1894 found the new building, housing the grade and two year high school, opened with Chas. Smeeten principal, and Miss Emma Mozier, of Danville, primary teacher, Miss Myra Mendenhall, of Vermilion Grove, E.J. Vines, Margretta Parks, and Minnie Shaw were among the first teachers of the new building. This school was the abode of the ambitious and industrious seeking to better to equip themselves for the future. This remained the seat of learning of the community until it was destroyed by fire December 27, 1921." "The present four year, accredited, Community High School was then built. It was completed and ready for use by September, 1923." "In this exceedingly well equipped house of ours, the Allerton School, boards with the financial support of the community has provided us with as well trained a set of foster parents as it can procure." "It remains for us, the student body, for whom all this has been done, to justify the vast expenditure of time, money, and energy, that has gone into the making of ALLERTON COMMUNITY HIGH SCHOOL." As stated above, a brick Allerton School building was built in 1923. In the mid-1950s a consolidation effort was launched between the towns of Allerton, Broadlands, and Longview. In 1953 it was decided to consolidate the school districts. The new district was named the A-B-L School District with the high school located in Broadlands. 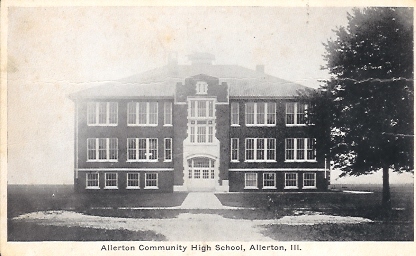 The above photo of the Allerton High School building was sent to us by Bob Hageman. It is actually the front of a postcard sent by Bob's great aunt, Ada Runyon of Allerton, to her sister, Dewey Runyon of Danville. 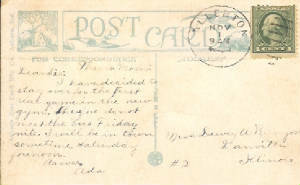 The back of the post card explained that Ada would be attending the first home game in Allerton's new gymnasium and would not make it to Danville until the next morning, on a Saturday. The year of the postcard is illegible, however the card and writing are a treasure. You can view the back of the post card at the bottom of this page. Thank you to Bob Hageman for sharing it with us! "The centennial history states that the old HS building burned Dec. 27, 1921 (story quoted from the _Allerton Sun_ newspaper). After the fire, the high school students were taught in the opera house above Black's store. The new building, built in 1922 (pictured above), opened with a four-year high school in September 1923. 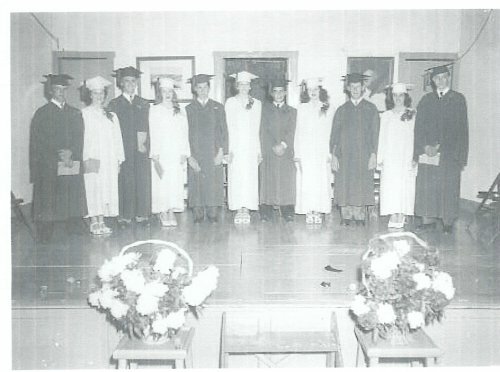 The first HS graduate was Hattie Black Goodall in 1898. An 1899 clipping from the _Allerton Times_ documents a baseball team and notes an enrollment in the HS of 37. Teachers, school board members, and other details are listed in this history. Samuel Allerton (1828-1914), who platted the village, made his fortune in Chicago after 1860 in agricultural investments, livestock markets, and banking. He founded First National Bank of Chicago in 1863 and owned Allerton Packing Co. in Chicago. Allerton purchased a 4,400 acre tract of land in 1880 from the Singer Sewing Machine founder J.G. Clark. He had previously visited the area when duck hunting with friends from Chicago. The Allertons also had substantial land holdings and made their home in the Monticello IL area. After the building was not longer in use, my father Ernst Mohr purchased it so that it would not be mis-used and linger in a deteriorated state. He platted the school ground for an addition to the town. Nine homes built from ca. 1980 occupy the former school grounds. He also arranged for the tympanum to be built into a brick arch on the grounds as a historical remembrance. Usable materials salvaged from the school building include chalk boards, light fixtures, and the kitchen cupboard doors. 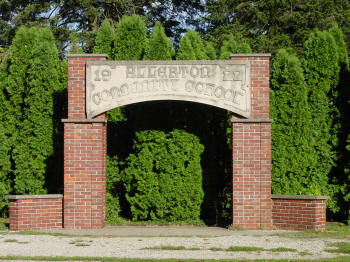 The original schoolhouse cornerstone was placed in the Allerton Historical Society museum. 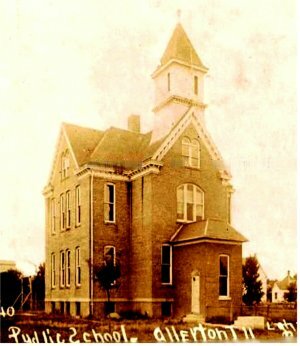 The town's centennial history, "A Century of Roots: Allerton, Illinois 1887-1987," has school history and many photographs on pp. 53-60 (photocopies can be obtained through interlibrary loan--ask at your local library)." Allerton HS team nickname: the "Bulldogs"
Allerton High School offered boys basketball and track for sure. We believe baseball was also offered. We are in need of the school team fight song, coach's names, seasonal records, and conference championships won. 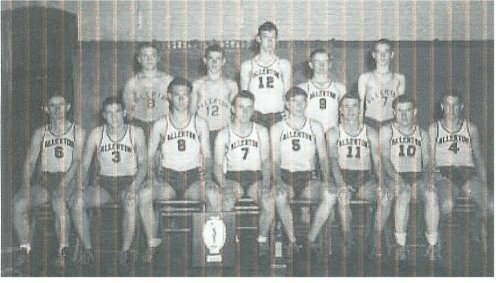 The boys basketball program of Allerton High had a nice run from the late 1930s to the early 1950s. During this time period a total of FIVE District titloes were won by the Allerton hardwood court teams. Unfortunately the team records and coach's names of these and other great AHS teams are not currently available. Scores from the website titled "Illinois Postseason Basketball Scores" are listed below as well. **Final game for Allerton High School, merged with Broadlands and Longview in the summer of 1953 to form A-B-L High School. Two Allerton High School boys brought home medals from the IHSA State Track Meet. They earned the medals under the old one-class system making their feat even more remarkable. "My father, Glenn Archer, and I built the brick structure that holds the tinpanum from the Allerton High School featured on your web site (see above photo). My grandfather, Cecil Archer, helped build the high school. 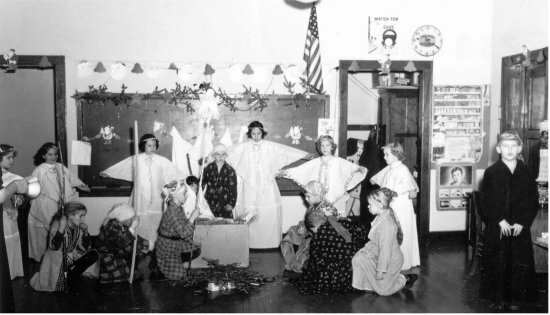 "The (photo to the right) is the 1910 Intermediated Class with Mary Hansen as the teacher. I was born in 1944 and Mary Hansen lived to an old age and I remember her when I was a kid living in Allerton in the 1950's. Also, the school mascot was the "Bulldog." I have some great aunts and uncles in the picture of the class but do not know at this point exactly who they are."